Akvo is working with UNICEF and the Ethiopian government in all woredas (districts) of the Somali Region of the country to support the development of the national WASH inventory (NWI). The inventory provides data on water supply schemes in urban and rural areas, sanitation and hygiene practices of households, and the status of water supply and sanitation facilities at health institutions and schools. Above: (l to r) Musie Harun Hassen, Water Resource Development Bureau; Muhyadin Abdirahman Hassen, Education Bureau; Mowlid Akil Aden, Health Bureau; and Ali Regah Ahmed, UNICEF. Below: (l to r) Muhyadin Abdirahman Hassen, Education Bureau; Musie Harun Hassen, Water Resource Development Bureau; Mowlid Akil Aden, Health Bureau; and Ali Regah Ahmed, UNICEF. 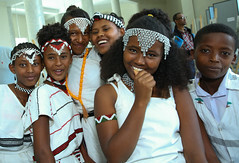 Photos by Mulugeta Ayene. Jijiga, Somali Region of Ethiopia, 11 December 2014. The Ethiopian government began work on the NWI in 2008. Over a four year period, data was collected across all parts of the country apart from the Somali Region. Initially, data gathering for the NWI was paper-based, but this proved problematic. As well as leading to lengthy data entry and cleaning procedures, the data was of poor quality and lots of important information was incorrect or missing, such as GPS data, functionality status, number of households within 1.5km from water sources and type of latrine or water supply. To overcome these challenges, UNICEF Ethiopia advised switching to smart phone technology and partnered with Akvo. During 2014, data was collected using Akvo FLOW across the whole Somali Region. This data is instantly available through an online, secure interface which allows any problems with data collection to be identified in real time and corrected straight away. Akvo has been providing technical support and direct oversight of data collection and transfer of data to the Government of Ethiopia’s management information system (MIS). The result is a robust, reliable data set for the region that can be used for policy planning and infrastructure management. The Somali Region is a vast desert area to the east of Ethiopia that is sparsely populated and prone to violent political conflicts. When planning the data collection operation, the security of survey enumerators was a concern. UNICEF reached out to all the NGOs working in the WASH sector in the region to ask for help. Everyone who could help did, providing transport, safe accommodation and car batteries or solar powered electricity points for phone-charging. The general approach was to take no chances with people’s safety. If progress was slow, so be it. At one point data collection stopped altogether for around three weeks until the situation was safe again. The scale of the operation was impressive with a total of 5,696 surveys completed in three months (including the three-week hiatus). 220 Samsung smart phones were configured with the Akvo FLOW software. A field test run was carried out to see how long the phone batteries would last so that an itinerary could be drawn up around that. Jo Pratt is communications manager at Akvo, based in the UK. Ethiopia is making great progress in measuring access to water and sanitation as well as inventorying all water schemes in the country through the National WASH Inventory (NWI). 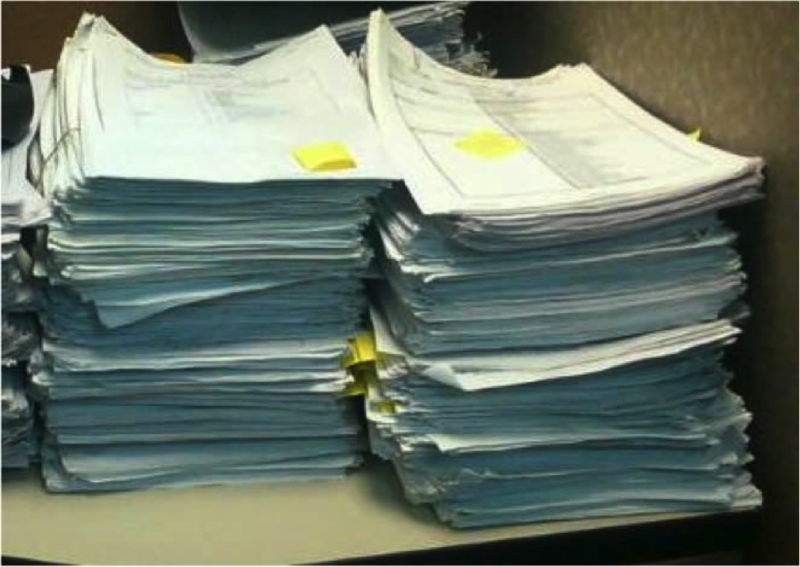 Previous data collection methods using paper-based surveys were extremely time consuming, involved huge costs, and had a high error rate. That is why the Government of Ethiopia has piloted the new data collection method using smart mobile phones in one of Ethiopia’s nine regions, the Somali Region. The software used was developed by the Dutch foundation AKVO using the AKVO flow system. Despite battery charging and internet challenges in the region, the new technology has been proven successful. Trained enumerators would collect data from households and visit water points, entering the data directly into previously uploaded survey forms on the mobile phone. Additionally, they save the exact GPS location of water points and take pictures of the water points. Huge amounts of data can be stored safely on mobile phones until the data is uploaded to a central online server (the cloud/dashboard). The transfer of data requires internet access through either a WiFi , 3G on the phone, or through a PC connected to the internet. Everyone with granted access to the cloud/dashboard can view the data, extract it in Excel sheets, visualise the data in pie charts and graphs and most importantly see the exact location of water points on maps. The experience from the Somali Region has shown that the use of smart mobile phones for data collection is time saving, accurate and cost efficient. The Government of Ethiopia has therefore decided to upscale the Somali experience to the rest of the country with the goal of having updated access of data for the NWI until June 2015. The newly established South Nations Nationalities Peoples Regional State data base system, SNNPInfo is launched with the presence of the Bureau of Finance and Economic Development Head Ato Haileberhan Zena Mamo,UNICEF SNNPR Head Joyce Gachiri and many other higher officials. The database can be accessed via the BoFED website, www.snnprsbofed.gov.et/SnnpInfo. SNNPInfo is based on DevInfo, a database system that harnesses the power of advanced information technology to compile and disseminate data on human development. The system has been endorsed royalty-free by the UN Development Assistance Group (DAG) to assist countries in monitoring achievement of the Millennium Development Goals (MDGs) for deployment on both desktops and the web. DevInfo provides methods to organize, store and display data in a uniform way to facilitate data sharing at the country level across government departments, UN agencies and development partners. 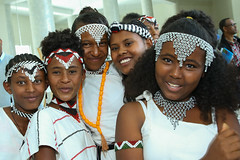 According to the Ethiopia’s RBM strategy, a strong database needs to be developed in order to improve the availability and timely dissemination of comprehensive statistical information to monitor and report the national/regional development efforts, to support policy analysis and decision making of government and development partners. Devinfo also contributes to the current national/regional development plan by supporting national authorities in harmonizing and standardizing collation, dissemination and use of data for planning, monitoring and advocacy. 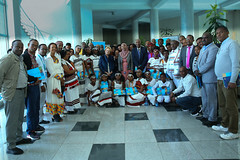 The United Nations Country Team, with the technical leadership of UNICEF, supported the Central Statistical Agency (CSA) to adopt DevInfo as EthioInfo, the Ethiopian in-country customization in 2006.EthioInfo was envisaged as a tool for strengthening the capacity of counterparts in generating and disseminating data for situation and outcome monitoring of national priorities within the PASDEP (2005-2010) & GTP (2011-2015) and United Nations Development Assistance Framework (UNDAF). EthioInfo is also a tool for enhancing the dissemination and use of statistical information and contributing to knowledge management efforts in Ethiopia. In the objective of supporting regional governments put in place a common system for electronic data storage, to better manage the monitoring of key socio-economic indicators and support evidence-based development planning and to track progress towards achievement of regional priorities within the framework of National growth and transformation plan and the MDGs, a regionally owned web- based database, SNNPInfo 1.2 is the third regionally devolved Devinfo database customized for SNNP region next to Amhara and Somali. UNICEF is assisting the regions both technically and financially to avail socio economic data on children and women on timely bases for planning, monitoring, evaluation and advocacy. SNNPInfo provides standard, accessible and timely benchmark data to partners, planners, policy makers, researchers and the general public for monitoring the GTP and other socio-economic indicators of the region. Currently the database contains 3 years (2010-2012 G.C) socio economic core indicators data selected from the regional GTP under 7 sectors; the future plan is to update the database bi-annually. The database supports both standard and user-defined indicators. It includes maps to administrative level for all zones and all woreda level. It also allows regional government and non-government organizations to link the database to all relevant administrative level data to be able to analyze geographic relationships of key indicators. SNNPInfo provides easy-to-use facilities for querying the database and based on the data retrieved for producing tables, graphs and maps for inclusion in reports and presentations. Furthermore, it helps the user to export/import data to and from different application software’s like Excel, Pdf and other application software programs. SNNPInfo is a powerful advocacy tool. It is expected to contribute to increase awareness on reporting of GTP/ MDG indicators at regional level among a wide range of stakeholders. It also helps facilitate customer service at different levels by providing data on reliable and timely bases.